Hello! I recently bought this little cactus at Home Depot, but it didn't come with any instructions. I was wondering if anyone could identify it, and possibly give me some advice on how to care for it? He seems to be happy in areas without too much sunlight, but I'm not sure. Also, the soil he came with isnt very good, and dries out easily. Do you think I could change it, or is it fine? Hi Taby, first off all, this is not a cactus; it's a succulent. Cactus are succulents, but not all succulents are cacti. This cute and lovely little plant is Adromischus cristata, or Baby Toes, which explains the way it looks like babies feet perfectly. It also goes by the name 'Crinkle Plant' and 'Pie Crust Plant' for obvious reasons. Someone else already asked me to identify their succulent here. I think your conditions are probably just about exactly right; this plant needs bright light, but can withstand not being in direct sunlight. I always recommend getting a small grow light for winter, because it might not get the day length it requires. The requirement for light is not just the intensity, but the hours of light it gets too; this is called photoperiod, and where these plants originate, close to the tropics, the daylength is always 12 hours of light, 12 of dark. They prefer that schedule. For the soil, no! Don't change it! Succulents need to be in well drained soil that dries out quickly. They cannot live in waterlogged soil, or even in soil that stays damp. They're not like any other house plant that you might have grown. Once the roots fill the pot, then you could repot into a larger container, using some similar type soil. Hope that helps get your succulent obsession off to a roaring start! Thank you so much for answering me! I'm glad to know my little guy will be happy with the soil he has, and I'll be sure to put him in a spot where there is more sunlight. Thanks again! I wouldn't doubt that the soil she has her A. cristata in is terrible for this plant. That being said, the reason being that all big box stores, and many other retailers, use soil that is mostly peat. Once the soil dries, it becomes hard. It also becomes hydrophobic. The water will not penetrate the soil without being soaked. In my honest opinion, when one brings a succulent home from Home Depot, Lowes, Walmart, etc., they should always repot. A very porous soil is needed. Excellent drainage is needed. Pumice, gravel, turface (Floor-dri/oil-dri from Walmart or Napa Auto Parts) works GREAT to amend soils. Good luck with your plant. Happy growing! I couldn't agree more - I usually recommend some kind of cactus soil, which generally has much more sandy components in it, or add pumice to whatever kind of soil you have - sometimes, you have to use whatever is available, in local stores. my plant has something growing out of the center. the stem is green and has grown almost 2 inches in 2 weeks. I am wondering do they flower at some point? Yes, these little guys flower - it's a long stalk, and it emerges from the center of the leaves. The flowers are very small, and in a cluster of white blooms. This plant is usually known as Key Lime Pie. I have never heard it referred to as Baby Toes, as there is a completely different succulent called Baby Toes. Kris, that's why I use botanical names, in preference to common names. In different places, a common name could refer to more than one completely different plants. Mine is in a south facing window and after sending up very thin stem of over a foot it made very small bloom buds. Be pa\ient. The buds make teeny blooms starting from bottom up. Mine has bloomed, sits in south facing window sill. Stem, very thin, over foot high,bloom buds open from bottom up over extended period of time. Kept mine in original soil & plastic pot, put pot in attractive container. Drench infrequently, plant "leaves" puff up with water. Grandchildren fascinated by plant. I don't have this plant, but want one. It has elongated fuzzy puffy leaves sprouting from the center core and the edges have scalloped ridges. There is a picture of one on your website. 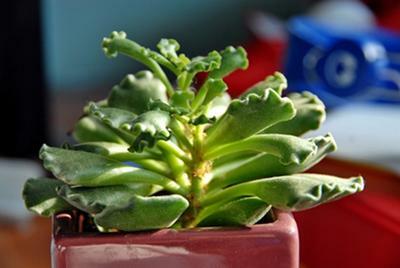 This little guy is Adromischus cristata, otherwise known as the pie crust plant, Key Lime plant or baby toes. Although they're very drought tolerant, they dislike hot summer sun, and will get sunburned, so a place that is bright, and with afternoon shade is perfect for them. Make sure the soil is extremely well drained, and avoid overwatering, like most succulents. The hairy stems tend to get discolored if you use too much fertilizer or hard water, so collect rainwater to use, or buy distilled water. Never use water that has run through a water softener, because this contains salts, which will be the death of these super sensitive plants. I got this little plant from a greenhouse at a hospital where I work. No one has been able to identify it for me and I haven't been able to find a picture on the internet of a similar succulent until I saw your website. Unfortunately, the picture was used for the link regarding 10 myths about succulents and I haven't been able to identify my plant. This little guy goes by several cute names; Pie Crust Plant (obvious, when you think about it); Key Lime Pie Plant, and several others. The true botanical name is Adromischus cristata (sometimes also listed as cristatus). This one looks like it's not really getting enough light; it should be much more compact, and not pale green at the base of the leaves. You may want to put it in a brighter window, or get a grow light for it. 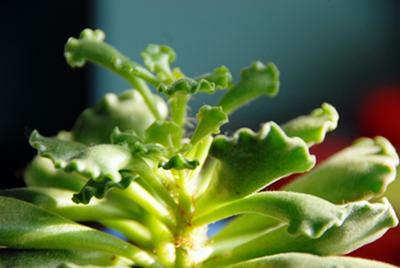 See other visitors questions and answers about this plant here; Adromischus cristata.